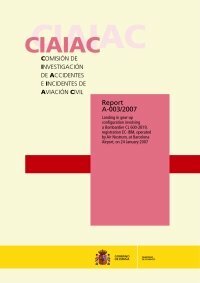 The Spanish Civil Aviation Accident and Incident Investigation Commission (CIAIAC) published its final report regarding the gear-up landing of a Canadair CRJ200 at Barcelona Airport, Spain in January 2007. The airplane was on a scheduled passenger flight operated by Air Nostrum, from Valladolid Airport (VLL) to Barcelona Airport (BCN). On the two previous flights, there had been problems with extending the flaps before landing. During the ground tests performed by the crew in Valladolid, the flaps extended and retracted normally, and so the captain decided to continue with the flights as scheduled. After taking off from Valladolid, the flaps were retracted normally and remained retracted during the cruise and descent phases until the initial approach to Barcelona, at which time they failed to extend to the 8-degree position when commanded, resulting in a “flap fail” warning on the EICAS. The copilot noted the discrepancy between the commanded 8° position on the flaps lever and the 0° indicated position. At that time they were below the clouds and under ATC radar control. There was no fire, though high temperatures and kerosene leaks were detected.